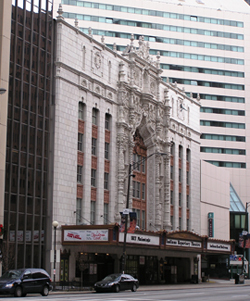 Indiana Theatre is the largest and most ornamented historic movie palace left in Indianapolis, a fine example of the great movie palaces of the flamboyant 1920s. The building also has one of the finest glazed terra cotta facades, and certainly the most ornamental, in town. The Indiana Theatre began its days as a movie palace but has served as the home of the Indiana Repertory Theatre since 1980. In 1927, the owners of the Circle Theater on Monument Circle hoped to capitalize on the success of that theater by opening a larger movie house. With an original capacity of 3,200, a ballroom, bowling alley, lunch counter, barber shop, and more, the Indiana Theatre exceeded expectations. Part of the sense of total immersion into another world began with the façade of the theatre itself. Architects Rubush & Hunter, themselves investors in the project, planned a fantastic Spanish Baroque exterior of pure white glazed terra cotta. The intricate weaving of morphed classical forms recalls the works of late 17th and 18th century Spanish architect Jose de Churriguera, whose works gave the name to the Churrigueresque style. Sculptor Alexander Sangernebo created the terra cotta molds that the F.E. Gates Marble and Tile Company used to make the terra cotta. The ornate interior matches the splendor of the Washington Street exterior front façade and contains a blend of exotic features. The Spanish theme is carried through to all major spaces, including main lobby, upper lobby, theater interior, and Indiana Roof Ballroom. Indiana Theatre is downtown at 140 W. Washington St. Except for the lobby, the building is only open for performances sponsored by the Indiana Repertory Theatre. Consult Indiana Repertory Theatre for more information. See a performance in the historic theatre; performances vary from contemporary to Shakespeare. The Indiana Theatre has been documented by the National Park Service's Historic American Buildings Survey.